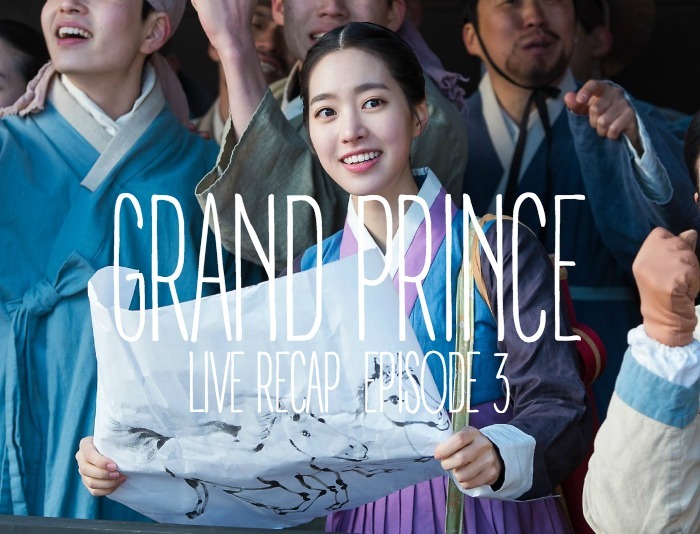 This is our live-ish recap (aftercap) for Grand Prince. We will update the post as we watch the drama so that it can get out as soon as possible for everyone who is waiting for subs. Hopefully we can help out with understanding what is going on with the drama! NEWSLETTER: I plan on sending out our first newsletter soon-ish! Subscribe here. 3 minute recap of the first two episodes. A man hits the gong and the Korean Polo game starts again. Everyone cheers. Then we cut to Hwi changing his clothing and inspecting his wound in the armory room. He sees the drawings that Ja-hyun made and unravels them, then he sees her skirt from behind the curtain. He slowly grabs his sword and cuts the curtain down, revealing JH standing behind it. He looks at her and she turns around, she’s been found out. But they recognize each other. He throws his sword to the ground, she said she was a lady but she looks like a maid today. What is her identity. She says it doesn’t matter, but he tells her that she is the intruder, is she a spy? She said she didnt’ even know what room she was in. He wasn’t to know the truth, if she isn’t a spy, then does she want to change her destiny. Is she one of those girls that is so interested in prines? JH slaps him, it is none of his business. She says she lost her way. He grabs her and wants to know why she hid, what is she looking for? Meanwhile, the game has ended, red team won. The brother shows up and the prince, Kang, hit his harm with something and it breaks off on his shoulder. He tells the brother that he would be dead if it was a war. he is out from everything now. The brother cowers in pain and blames his sister. His sister meanwhile tells Hwi that she wasn’t looking for anything, she was just hiding. She would already be out right now if it wasn’t for him. But then he starts to yell in pain and JH pushes him out of the way. SHe runs out, but it looks like she is worried about Hwi…he was kind of passing out and she saw blood on her hands from where she pushed him. She turns back around. We cut to her bandaging him. She thinks he should show his injury to a doctor. He wasnts to know if she came back because she was worred about him? She said she came back because people would accuse her for killing him. But he mentions her drawing, he thought she came back to get it. She goes and gets it while mumbling. But then Hwi says that he wants to know who she is, reveal her identity to him. She leaves without revealing anything and runs into prince Jin-yang. She is startled and Hwi tells he to just leave right now. he tells his brother that she was in the wrong room. But the brother gives his guards a signal to follow the girl. He goes inside to inspect his brother but Hwi says not to worry about it. He tells him that they won easily becsause Hwi wasn’t there and that luck is also apart of ES’s ability. Prince Jin-yang says they should soothe the loser, he will find the best woman giseng to give to him, he can make him a real man tonight. Meanwhile JH is walking doewn the road and sees her parents. She starts running right away and teh parents start to yell at her. But then an official grabs her and pulls her back to her parents. The guard that is watching her is also watching all of this unfold. JH’s friends see her running as well and talk about how strange JH is for sneaking out. But one of them wants to visit her and see what she is thinking. Meanwhile Prince Jin-yangs guard tells him about JH, she is the daughter of a scholar. JY wonders why the daughter of a scholar is visiting his brother. The pregnant who snuck into the palace is giving birth to the only prince. They think they need to cover it up if something goes wrong. it looks like something might be going wrong as blood is all over a napkin and a women runs out saying they don’t see the head. The baby is coming out leg first. They tell the maid to tell the baby to turn by pocking it. But the mother says she doesn’t care about the mother, just save the child. The mother passes out and the queen asks if baby is alive? is it a prince? Meanwhile the servant is playing all by herself. She is acting like she is the mistress and not the maid as she plays both roles. But then JH’s mother comes in with JH and the maid spits out a strawberry. JH’s mother yells at her, should she sell her to a little island! She is supposed to stop her daughter from doing all these things! JH tries to take up for her maid, but the mother says she heard the maid from outside the room, take her out! The maid gets taken out while telling her that she apologizes! My lady! But the mother says to sell the maid to the merchant, it doens’t matter what the price is. The brother comes and wants to know why the maid is suffering like this. The mother says JH won’t be able to plan these crazy things if she doesn’t have a maid. JH says she will go to a temple and be a monk but the mom just responds, are you threatening your mother! THe brother lets them know that Prince Jin-yang will have a party at their home. The mother basically forgives all as she runs off to prepare for this party. So the maid is saved and it also looks like the brother likes the maid. The sister and brother argue and the brother shows her his injury. He probably would have been killed if they lost the game. Don’t taint their family name anymore. Meanwhile, the mother is walking with all her maids and asks them how she looked, did she look scary like a tiger mom? The maids let her know that she was super sracy, she thought she was selling her for real. The mother says, if she didn’t do it then the men in the family would kill the maid. The maids tell her to just be herself but the mother thinks that isn’t good. Then we see them preparing everything for the party. They need to pick all the right food and wine. This household is the household of the biggest scholar in Korea, so they are very rich, maybe the richest family outside of the kingdom. That is why Prince Jin-yang is so interested in Ja-hyun. The mother says they don’t have enought time so they need to invite some more ladies to the kitchen. Cut to the Uncle and Prince JY taking a flower bath together with all the gisengs around. The brother nods to his guard and we see a woman come in wearing a pink outfit, she start dancing but the prince says no, another one comes in but the prince says no, all the women leave. The uncle and pricne talk about the Kigns wife. The uncle says the king has many wives and they get pregnant, but they won’t be able to produce a prince. hahaha. Another set of gisengs comes in and the brother is interested. She says her name is Cho Yoo-kyung. Hwi is lookingo ut for his horse and the servant wants to find out who did it. But Hwi doesn’t want to find out, he thinks there are two cases, the one who wants us to lose or someone who wants me injured. Both cases will be a big issue, so they can just cover it up. What is the role of a prince? A lot of people died for power so for his older brother, he should work hard and his job is to make everything peaceful. That is his only dream. He feels sorry for his horse, he was injured because of a human. The servant tells him that he is worred about Hwi more than a horse. Prince JY asks this giseng to soothe his brother since he lost. His brother doesn’t know about women, so she will be able to make him into a man. If she can do that, then he will give her a lot of presents. YG tells them that she is not a prostiture, she is an entertainer. They says she is the one that is famous about her pride and start laughing. She says she will decide who will steal her heart between him and his brother. JY laughs at her and then throws a dagger at her, it scratches her face. He tells her that she is over her limit, dont’ think about her, just think about seducing his brother, if she fails then everything she has will be gone. Yoo-kyung picks up something and approaches Lee Kang. She puts alcohol in the cup that Yoo-kyung thres at her and drinks it. Then she goes up to kang and gets into the water, gives him a kiss with the alcohol, it runs down his face. She wipes the alcohol from his face and tells him that she will see him at the party. The uncle nods his head and laughs, she is something. Why don’t you take her? Jin-yang thinks he will make her his person, not his woman. She will be the prettiest spy in Joseon. Uncle laughs that she can be a pretty member of his arsenal. Uncle and nephew joke a little bit more about the scholars daughter. Prince Jin-yang invites teh uncle to the party but the uncle tells him to just enjoy and he will do old people things. Cut to ES getting treatment for his arm. Then a guard comes in. His brother guard tells him to come to a party at the scholars house. Hwi sighs. Then we cut to JH and her maid. The maid wants to know if the man was naked? She is done, she won’t be able to get married! She should have screamed! But JH just tells her that it was only his top. They then talk about how he was handsome right? But JH doesn’t want to talk about those things, she will jsut forget about him. The maid thinks this is fate, but JH says they need to meet more than 3 times for it to be fate. They keep talking about fate as JH starts to prepare for the party. The maid says she will be her maid forever, even if she gets married. They joke about becoming a betrayer to each other, we’ll see who betrayes who. While everyone is getting ready and preparing, JH thinks about the horses and starts to draw then again. Then she thinks about the advice that Hwi told her about drawing horses, she shouldn’t draw horses like flowers, she should make them look tougher. Jh starts to do waht he said as she continues to paint. Jin-yang comes to the party early to apologize about what happened with his shoulder, maybe he was too cruel earlier. The brother says it is okay. Then the rpince says he saw a lady at that place, the brother says his sister was looking for him. the prince asks if he can have some tea from his sister and the brother thinks that something must be going on. the maid runs into the sisters room and tells her that she should come out because the prince came. JH isn’t interested in coming out, but the maid pulls her out against her will. It is the first chance to see the face of his highness! JH reluctantly goes out with the tea and sees the Prince, seh remembers him from the armory room. The prince notices her as well and stands, he says it is his apology for asking a lady to do this. JH starts to run off, but she trips and injurs her leg. The prince runs to her side, is she okay? Is she injured? She stands and says she is okay while her brother mutters that she should be careful in front of the prince. Then the prince comments that he didn’t know that the brother had such a beautiful sister. The brother says she is a trouble maker, they stopped her from going out earlier which is why she was wearing those clothes. The prince says she can be a butterfly later and looks at JH. Prince Eun-sung (Hwi) shows up and sees JH serving the prince. he wonders what is going on. Then we cut back to the tea. JH accidentally spills the tea becasue the prince mocked her. The brother says, see, she is clumsy. She says she will be better if she isn’t mocked. She also mentions that her brother was treated like a horse becuse of her. She says that the prince doesn’t want their subjects respect, he wants their fear. The prince thinks about this and says he is not a good general, but he is a brave general. JH says cruelty is not for a brave soildier (her brother yells at her to shut up). But the prince says he has good sister who thinks about her brother so much. He mentioned that he apologized, what else should he do? She says that he apologized so that is good, but he should accept your apology. The brother tells JH to shoo, shoo, and then apologizes to the prince, please forget what his sister said. JH leaves and the maid tells her that she is crazy for talking to him like that. Thent he maid pushes her on accident and she runs into HWi, they accidentally hug. She asks HWi why he is there and he says he is there for the party, she can speak banmal to him if she wants sivne they agreed on it. He apologizes for his behavior at the paint shop, he knew it was wrong, men bluff like that sometimes. JH says only real men can accept their faults, Hwi says it is because he is not a real man yet, can she accept his apology. She says he looks likea man right now and Hwi smiesl at her. JH is mesmerized by his smile. But then she manages to blink herself out of it and tells Hwi that he should go meet her brother, he is with the prince. JH leaves and the maid asks her if that is the mans she saw naked? Maybe this is fate, the second meeting became the third meeting! But JH just tells her to shut up and pulls her away. Some of the uncles men have a meeting, they want Jin-yang to be the king since there is no other prince right now. But then someone comes in and says something big just happened. We cut to the Queen and the baby, the King finally has his heir. The king holds his son, mesmerized. The Queen is still alive so teh King thanks her, she did a good job. Cut to to the friends coming to the party. The best friends are invited (or they are crashing). They wonder if it is too late to go there? One of them says that they are going there to see JH, not for the party. Then we see a dance that Cho Yoo-kyung gives to all the men at the party. Gisengs are all around the party, there is one for each man. Then the dance ends and YG gives Jin-yang a gift to congratulate him for his win. Then she goes to sit with Hwi and asks if she can have a drink from him. He tells Hwi that his brother loves him a lot, he told her to serve him and it is her honor to serve him. Hwi says it is a mistake, he doens’t need a woman. Jin-yang tells her that he warned her, his brother is a shy person. Hwi says no entertainer picks whom to serve, leave. Everyone laughs that Hwi is ditching YG. She isn’t laughing though. Prince JY tells her not to be dissapointed, but YG says night time comes every night and this isnt’ the only change she will have. Prince JY tells his brother not to let a woman have a grudge against her. Meanwhile the ladies are talking at JH’s place. They want to look around and see how the Prince handles Gisengs. But NG doesn’t think they should associate themselves with Gisengs. They should make it so that he comes to them. But JH says they sholndt’ come to her room. NG says she was picked by the palace as his wife but she has never met him before, she wants to meet him. JH tells her that it doesn’t matter what he thinks about you, but she wants to see what kind of person he is. Can she help? JH smiles, of course, that is right up her alley. Cut to the maid talking to one of the guards. She is flirting with him and tells him that she wants to give him some food since they are both servants. But he just pushes her away. She storms back up to him and tells him that her real mission is to give him this. She hands him a note to give to his master. The man delivers it so he Prince starts to read it. He doesn’t really understand what is going on and Hwi looks on at him. The prince goes to the main building and sees a woman there with her back turned. He asks her if she still has somthing to tell/punish him about. But then NG turns around and bows to him. He asks who she is and seh says that she is soon to be his wife, Na-gyum. The lady from this house is her best friend so she asked her to send you a letter as a favor. Sicne I know that you are here, I thought I should greet you. So you called your fiance before getting married? I acknowledge that you kicked out your older sister and became my future wife. NG tells him that the princess picking group came to their house when her sister was sick. She greated them instead which is why they reported her to tha palace and not her sister. But JY wants to know why her sister was sick? Don’t do dirty things like this anymore. NG yells that she drugged her sister, that was her plan, she wanted to be his wife so she can have the position she wants and the man she wants. Her sister was not qualified for the position and shouldn’t get it just because she was first. That is not fair. It is not fair to the second sister. JY comes up to her and kisses her strongly on the lips, but she pushes him away and slaps him. She is not like one of those entertainers dancing! She wants to be his wife, but that doens’t mean that she wants to be mistreated. JY says she wants the position of the princes wife and not him. He expected that. he leaves and NG tries to hold in her anger. The uncle arrives at the party and tells Hwi to find his brother, a prinve was born. Hwi is so happy about that, a healthy prince! I will go find him! Meanwhile NG goes to report how the prince was, but she doesn’t have to becasue the friends secretly watched their meeting. They don’t tell her that they watched it though and just let their friend say all the nice things about the prince. The friends leave and SH laughs in her carriage at how much of a liar NG is. But NG is angry in her carriage at her first meeting with the prince. Back in the house, JH goes back to her room, but the prince stops her. He tells her that another woman was waiting for him. JH says she thought he would be happy to see his future bride. She is the smartest among her friend group, he doens’t deserve her. The prince slowly starts to walk up to JH and tells her that she thinks not only of her brother, but also of her friend a lot. She disdains the royal family for her friend. Isn’t her life precious to her? JH asks if she is being thretened and he says he isn’t threatening her, he is giving her mercy. He can just kill her because she disdained the royal family. She tries to leave, but he holds her back. He tells her that she should be his wife if she douesnt’ want her friend to be it. JH tells him that he is really crazy. then we see Hwi stumbling happuly onto their conversation. he looks at the two of them and their is a moment of them all looking at each other. Scene 1: JH gets mad at ES because he hurt her pride and she slaps him. Scene 2: JH comes back to JY to treat his wound. JY sees her leaving the room. Scene 3: The Prince is about to be born but legs first. The grand Queen says to save the baby prince first, not the mother. Scene 4: The maid is about to kicked out but DS (JH’s brother) defends for her. Scene 5: JY and YA talk about making JY the next King. Scene 6: Gisaeng, YG, is overly confident so JY throws his cup at her. But instead of getting mad, she kisses him. Scene 7: JY visits JH’s house and asks her brother to bring her to him to serve him tea. Scene 8: JH criticizes JY about hitting her brother. ES (Hwi) sneak peaks at them and smiles. Scene 9: JH and ES bumps into each other. He apologizes to her first. Scene 10: YA and his people are in a panic after hearing that the baby prince is born. Scene 12: NG calls JY by asking JH to write him a letter. But he kisses her so JY slaps him. She is not a giesang! Scene 13: JY grabs JH and threatens her to marry him. She tells him he is crazy. Thank you so much for the live recap! I really love this show so far!!! Thank you so much! I watched it live following your guide (thank you so much for that!) Now I understand it better.